Van Wyck Gazette: Where did it all start? Ben Basile: I was in sixth grade and, at the time, I didn’t really have a relationship with music. I had never been to a concert, didn’t have a favorite band, and didn’t own a single band T-shirt! My older sister, Carolanne, was already in high school: a place where musical identity defines you. One day, she handed me a stack of cds and said, “Let me know which ones you like, and I’ll burn you some copies.” I remember diving in head first, listening to every cd she gave me. She later took me to my first couple of concerts at The Chance Theater in Poughkeepsie. I was hooked. 20 years later now things have switched: I’m the one introducing my sister to new bands. And although they’re all scratched up and barely playable, I still have a handful of those cds left. And they changed my life. VWG: How’d you get into playing bass? Ben Basile: I was in tenth grade and my friend Anthony got a bass guitar as a present. A couple months later, It didn’t really click with him and the bass was collecting dust. Curious about the instrument, I asked to borrow it and check it out. Having grown up listening to ska and reggae music, genres where the bass’ role is very prominent, I was immediately drawn to the strong foundation provided by the bass. Today, my time is split evenly between electric bass and upright bass. If I had to go back and do it all over again, I would still pick the bass. It’s a relatively in demand instrument, and has provided me with many musical opportunities over the years. VWG: What are your bands/groups you perform with? Ben Basile: That’s a loaded question, as a full time musician, I’m involved with many different projects. I’ll list off a few: I recently started an instrumental reggae and ska band called Rukumbine. I lead a funk and soul cover band, In The Pocket, we’ve been around for ten years now. For the past six years, I’ve ran a weekly jazz jam session in Poughkeepsie with a group called The Poughkeepsie Jazz Project. I also play with a ska punk band from Boston, Massachusetts, called Big D and The Kids Table; they’ve taken me all over the world over the past six years. Big D and The Kids Table also has a side project, The Doped Up Dollies, I’ve recorded with them and occasionally perform with them as well. I periodically work as a sideman with local songwriters: Liana Gabel, Michael Hollis, and Dylan Doyle. On top of all that, I perform as a sideman and/or band leader with various jazz groups, with a rotating lineup of local musicians. VWG: Can you say more about the Poughkeepsie Jazz Project? 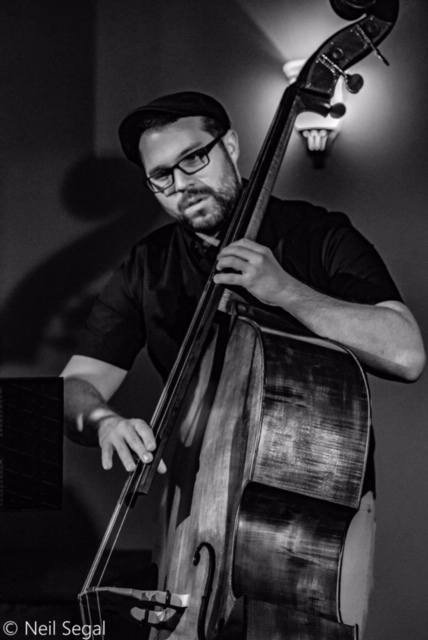 Ben Basile: In 2012 I started a weekly jazz jam session in Poughkeepsie, under the name of The Poughkeepsie Jazz Project. We’re currently hosted at Mahoney’s Irish Pub and Restaurant on Main St. The jam session is every Tuesday night, from 7-10pm. Just recently, I’ve teamed up with The ARTBAR Gallery on Broadway in Kingston. We host a jazz jam session that meets the third Thursday of each month, also from 7-10pm. The jam sessions are great for the local music scene and community! Providing a space for beginners, hobbyists, enthusiasts, and professionals to meet and perform together. I’ve met many wonderful musicians and friends over the years from hosting these sessions. It’s really cool to see the network and community grow with each jam session. VWG: What do you like about touring? Ben Basile: Touring is an amazing opportunity which I’m very grateful for. I’ve performed on six different continents over the past few years. It’s pretty intense being in a different city, or country, each night! Traveling really puts life into perspective, and I’m happy to say that I have friends everywhere. But honestly, my favorite part of touring is the food: Spanish tortilla, Belgian dark chocolate, Filipino lechon, a proper full English breakfast, Mexican street tacos… I could go on! VWG: You’re also a music teacher? Ben Basile: Yes, teaching is great, I always enjoy seeing my students grow as musicians! I’ve had many great teachers who have inspired me, so I try to do the same for my students. I mainly teach electric bass and upright bass, but I also teach music theory, improvisation, and beginner piano/guitar/ukulele. VWG: Why do you play music? Ben Basile: I keep at it every day, every week, because I feel it’s important. It’s something that is necessary in the world. I feel like I’m giving back to a community/world that’s given me so much. I’m paying tribute to the artists and teachers who have inspired me. Also, the way I see it is, music helps make the world a better place. If I can help one person escape and live in the moment. I’m gonna do it. One gig, one lesson, one song, one note at a time, I’ll keep playing. VWG: As a full time musician, is it true you have to be a “starving artist”? Ben Basile: I talk about this all the time. It’s really all about living within your means. I pay attention to where my money goes, and I focus on what I actually need. Sure, there are some sacrifices at times, but for me it’s really all about quality of life and continuing to work on my art. VWG: Anything we can look forward to?